Name of the Trip : "“ Source of The Ganges – Gomukh Trek "
Enjoy 6 nights 7 days trip to the heart of majestic mountains, and trekking to the source of the most important river and the living Goddess of India, The Ganges. We make exclusive walks to the base of of high peaks and to witness the out standing sun rise and sun set on Shivling and Bhagirathi group of peaks. One joins Indian pilgrims doing their pilgrimage to the source of Ganges and encounters Babas & Sadhus on trek, some of them living round the year in difficult cold conditions doing yoga, meditation and other spiritual practices. This is a easy-medium difficulty trek which can be extended to include Tapovan or Nadanvan. The trek starts from Gangotri ( `Ganga-utri` implies Ganga Descends ), is a town of great religious significance, it is considered that Ganga had finally descended here in the form of the mighty Bhagirathi river, and from here it carries on its long journey towards the plains. The trek will give a complete experience, right from self supported journey to camping in deep Himalayas. The itinerary is easy paced, and will give ample time to the participants to enjoy the surroundings at leisure. In the morning after breakfast drive to Rishikesh via Haridwar. Upon arrival at Rishikesh met our representative and check in to hotel. Evening free to explore the area. Dinner and overnight stay at the hotel. Morning after breakfast proceed for Uttarkashi (1150 mt), which takes 7-8 hrs drive. Upon arrival check-in at Hotel. Evening free to explore the surrounding by your own. Overnight stay at hotel. Uttarkashi is the principle town in the region. Nehru Institute of Mountaineering is situated here. It is also the gateway to many mountaineering and trekking expedition in Gangotri area. Morning after breakfast drive to reach Gangotri via Harsil (approx 25 km before Gangotri (3048 mt) by covering approx 95 km in 4-5 hrs. On arrival check-into Hotel. Overnight stay. There is a beautiful Gorge at Bhairon Ghati over which there is a steel guarder bridge. Gangotri is the place where the Goddess Ganga descended on Earth from Heaven. There is a Temple of Goddess Ganga where thousands of devotees throng to pay homage to her. Gangotri : The shrine of Gangotri is situated at an elevation of 3200 m surrounded by deodars and pines. The original temple was constructed by the Gorkha General Amar Singh Thapa. Every year people from all around the world visit this shrine. A number of ashrams and Dharamshala are located on the other side of the river. It is believed that Raja Bhagirath used to worship Shiva on a slab of rock "Bhagirath Shila" situated near the temple. Submerged in the river there is a natural Shivling where, according to mythology, Lord Shiva sat when he received the Goddess Ganga in his matted locks. A days trek takes one to Gomukh, the source of the mighty Ganges. 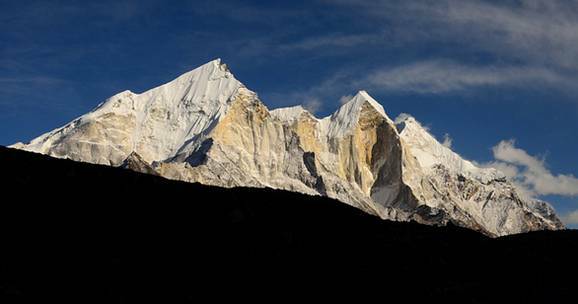 Early in the Morning enjoy the panoramic view of Bhagirathi group of peaks. After breakfast trek to Gomukh (3890mt), the source of the Ganges. Gomukh is where the water of Ganga trickles down from the glaciers. The sages called it 'Gomukh', because in the distant past, it probably appeared like a cow's mouth. Explore the area and trek back to Bhojwassa. Dinner and overnight stay in camp. Gomukh : The Gomukh glacier is the source of Bhagirathi (Ganges) and is held in high esteem by the devout who do not miss the opportunity to have a holy dip in the bone chilling icy water. Morning after breakfast drive to Delhi via Haridwar. On arrival transfer to hotel. Overnight stay. Tour & Services Ends Here. Other Option Trekking Trip till Gaumkuh Trek to Tapovan and back to Gangotri. Gaumukh is where the waters of Ganga trickles down from the glaciers. The sages calledit 'Gaumukh', because in the distance past, probably appeared like a cows mouth: though today, it no longer appears so. From Gangotri you move along the beaten track towards Chirbasa, which is on the treeline. From here you can have clear view of Bhagirathi peaks. Beyond Chirbasa the terrain becomes desolate and barren. Infact it has been reffered to as the Arctic Tundra by many trekkers. From Chirbasa you reach Bhojbasa. Gaumukh Glacier is just 4Kms ahead. From Gaumukh to Tapovan the ascent is steep and as you climb the view of the surrounding peaks is clearer. They appear to be just a stone throw away. Day 7 :- Gangotri to Rishikesh. 1.Twin sharing accommodation as per the itinerary. Single room can be provided on a supplementary cost. 2.All meals during the entire trip- from lunch on day 01 till lunch*on day 04. 3.Transportation from Rishikesh to Rishikesh by Toyota jeeps Toyota Jeeps. 4. Services of English speaking professional trekking guide during the entire trip. 5.Portage of 01 piece of personal rucksack (10 Kgs) on the trek. 6.Trekking permits & fees on the trek. 9.Visit to the entire place as per the itinerary. 1. Items of personal nature e.g table drinks, telephone, insurance, medical services, evacuation and services in landslides & unforeseen circumstances. 2. Riding ponies on the trek. 1. Subject to Government service taxes which is 3.5% at present. 3. Valid for the Trekking season for 2015 March to November . Number of Persons on the trek: Minimum 02 members are required to run any of the fix departure trips .To ensure low impact treks & personalised services Maximum number of person on any trip goes to 09. Package Tariff - The above package tariff is for standard option. You can also opt for deluxe option with better transport, accommodation, meal options & highly professional staff on the trip. Please let us know. Food on the trek: We emphasize on clean and hygienic meal s on the trek. Breakfast & Dinner are full hot meals. Lunches are picnic lunches as we driving or trekking that time. Water on the trek: we carry ample of bottled water in the jeep which can be used for the driving days. For the trek we use boiled stream water, which is equally good or some time better. Your Travel to Rishikesh - As we have a fleet of cars & jeeps, we shall be happy to provide you pickups from Delhi & Dehradun Airport. We shall also help you arrange you flight or train tickets from Delhi to Haridwar & Dehradun. First Aid on the trek: we carry a good first Aid Kit on the trek, however it is recommended to carry your own specific requirements.